This category covers builders primarily engaged in the construction of single-family houses and other buildings for sale on their own account rather than as contractors. Establishments primarily engaged in the construction (including renovation) of buildings for lease or rental on their own account are classified in the Real Estate Operators (Except Developers) and Lessors industries. Historically low interest rates in the early 2000s fueled an unprecedented housing boom in the United States. In 2003, new home sales exceeded 1 million for the first time in industry history. All segments of the residential construction industry, including operative builders, benefited from brisk new home sales. According to the National Association of Home Builders, the outlook for the U.S. housing industry remained favorable through at least 2005. Unlike general contractors who perform construction work on a for-hire basis for the owner or owners of a development, operative builders are the owners of the structures they erect and act as their own general contractor. In addition to construction, operative builders also engage in land acquisition, sales, and a host of other nonconstruction activities associated with developing and selling properties. Historically, operative building has traditionally accounted for a comparatively small percentage of construction. Typically during the 1990s, operative builders employed fewer construction workers than general contractors and employed a higher proportion of non-construction employees such as executives, salespeople, administrative staff, and other professional categories, reflective of their wider involvement in site development, property sales, and other activities not performed by general contractors. Although operative builders were primarily involved in construction, their principal industry activities also included subdivider and site development work, real estate management activities, land sales, construction-related activities, and miscellaneous operations. The vast majority (95 percent) of the construction performed by industry firms involved the erection of new buildings and service facilities and the installation of equipment such as elevators, heating and air conditioning, and plumbing. A small proportion of construction activities involved renovation work, such as additions, alterations, or reconstruction, and maintenance and repair. An important component of the industry's nonconstruction-related activities was the acquisition of land for development of its own properties or for resale in developed, undeveloped, or partially developed form to purchasers such as other builders. Industry firms considering the purchase of a tract of land evaluated it on its cost, or based on marketing and demographic studies conducted by the operative builder or by consultants. Other criteria included financial and legal considerations, governmental approvals and entitlements, environmental factors, the firm's experience in a particular market, real estate market trends and the health of the economy in general. Engle Homes of Florida, for example, primarily purchased land already "improved" for building construction, land requiring site improvements, and "options" on improved land permitting the company to buy the site when market demand warranted construction. Firms that can afford to carry the costs of a large undeveloped "land inventory" may ultimately benefit from having purchased large tracts rather than several smaller, more expensive parcels when it comes time to construct a large master-planned community on the site. It generally takes five years to develop purchased land into master-planned communities or subdivisions, while smaller, more conventional residential projects take two to three years to complete. The purchase of land tracts involves a "contingency period" while zoning, environmental, and other governmental and infrastructure requirements are met. In the 1980s and early 1990s, several factors had compelled the building industry to seek new means for acquiring financing for land purchases: the federal Tax Reform Act of 1986, the revision of commercial banks' loan underwriting standards, and the decline of the U.S. savings and loan industry. One such approach was the formation of "land bank partnerships" in which investors pooled their resources to purchase land and used provisions in the tax code to avoid the costs associated with carrying the debt from the purchase of land on their balance sheets. After purchasing land for a master-planned community, industry firms must determine the layout, size, and style of each of the site's lots, as well as the design of the overall community. A product line is then developed, based on such factors as existing housing, the expenditure for the lots, and the projected needs of the specific market. Once these general guidelines are established, the firm seeks the necessary governmental approvals, performs specific site planning, constructs or contracts for the construction of roads, sewers, water and drainage facilities, and, if necessary, conducts other engineering operations. The development of the "balloon frame" building technique in the 1830s, with which homes could be constructed by laborers rather than skilled carpenters, represented the birth of modern, industrialized home construction methods in the United States. Contemporary two-story homes are generally constructed using a "platform frame" method in which the studs that support the roof rest on the second story rather than extending all the way to the ground floor as in traditional balloon frames. Single-family homes—both detached and attached—were the most common structures erected by operative builders during the late 1980s. The modern home is much more than a frame, floor, roof, and walls, however; home builders must install pipes for plumbing, fiberglass for insulation, ductwork for heating and air conditioning, special flooring for bathrooms and kitchens, and conduits for electrical wiring, as well as a wide range of building components. Office buildings, industrial buildings and warehouses, and commercial buildings such as stores, restaurants, and service stations represent a not insubstantial amount of construction activity. Industry firms also developed and constructed condominiums, defined as townhouses, apartments, or any other structures in which the purchaser owns title to the three-dimensional space occupied by the unit as well as an undivided interest in the building's common property. Industry firms also developed cooperative apartments, which have the same physical form as condominiums but in which purchasers hold stock in the company that owns the apartment rather than owning a unit of space. Industry firms also engage in speculative building—structures built in the expectation of future demand without prearranged purchasers. The operative building market, like other construction markets, is "counter cyclical." Operative builders are significantly dependent on the freeing up of credit from lending institutions that occurs when depressed economic conditions limit the number of industrial or manufacturing borrowers seeking loans for expansion. Because money loaned by banks and other financial institutions is more readily available to home-buyers and construction firms when the economy is in the trough of an economic cycle, the home building industry generally begins to improve when economic conditions are at their worst, thus earning the designation "counter cyclical." Home builders also are strongly affected by interest rate levels and general consumer confidence. Other economic factors affecting the home building industry include demographic trends, such as the number of adults in the prime home-buying years (ages 25-44), changes in the mortgage financing industry, increases in energy costs and property taxes, labor and building materials costs, and changes in consumer preferences. The residential building industry during the 1990s and 2000s, was highly competitive, with only a few firms competing at the national level. Builders compete on the basis of location, reputation, quality of construction, price, design quality, and amenities, among other factors. Builders with strong administrative and paperwork processing operations, superior on-site management, and sound construction systems were generally the most competitive. Most residential building firms (including operative builders) were small, with the number of units constructed by a single establishment averaging 25 or less per year, although industry giants such as Centex, Pulte, Ryland, Lennar, and Beazer far exceeded this total. Such firms often started out by building a small number of homes, acquiring additional land, and then gradually expanding their market geographically and perhaps demographically as well, offering, for example, "first home" residential construction, then moving up to expensive high-end home construction. Among the preliminary activities that may be conducted by start-up builders before beginning their first construction project were: market research of the communities in which they intend to sell, prearrangement of financing for their initial construction activities, analysis of competition, exploration of business relationships with construction suppliers, installation of computer-aided design computer systems for floor plan design and modification, or consultations with area realtors and investors. Using specialized formulas, builders conducting market research were able to determine with some accuracy how many homes of a certain type would be purchased in a particular subdivision or development. Builders may finance their construction activities through revolving lines of credit offered by commercial banks using the firm's inventory of homes as collateral. The actual amount of credit extended to the builder may be based on the value of the homes the builder has sold and may be about 50 percent of the home's intended sale price. Builders can expect profits of perhaps 15 percent of the sale price of a home. Larger home builders tend to have the financial resources to survive housing downturns and exploit emerging housing trends. An important initial decision for the operative builder during the 1990s and 2000 swas the choice between constructing and marketing individually designed homes or offering so-called "market units," a choice between unique home specifications and floor plans or more generic housing specifications keyed to a specific demographic market, master-planned development, or architectural style. Some firms offer a "personal builder" program in which home buyers can modify the builder's design plans to arrive at a "semi-customized" home. Other builders may purchase pre-designed house plans from "plan service" firms, thus eliminating design and architectural costs from their budgets. In fact, many builders use the elevations provided in catalogs of home plans such as Sweet's Catalogue Files rather than incur the expense of retaining an architect. The types of homes built by industry firms during the 2000s were as diverse as the U.S. housing market itself, ranging from government subsidized lower-income developments to customized, high-end estate homes. Housing markets can be classified according to taste, race, family status, location (neighborhood as well as region), employment patterns, income, or age. Across all housing levels several trends have merged since the late 1970s. Mean home size has continued to increase and the percentage of new homes with 2,400 square feet of space or more has risen notably. Between 1978 and 1995 the percentage of homes with central air conditioning grew from 58 percent to 80 percent, those with two-car garages or larger increased from 52 percent to 76 percent, and homes with two and one-half baths or more nearly doubled, growing from 25 percent to 48 percent. By 2003, over 52 percent of homes were two-story and 37 percent were larger than 2,400 square feet. Roughly 55 percent contained two and one-half baths, while 36 percent had four or more bedrooms. One of the largest hurdles faced by prospective operative builders was arranging financing through banks, which are much more inclined to lend money to established builders. In some markets construction financing was provided to builders by their suppliers (such as lumber companies) which could monitor the builder's financing needs and construction progress by observing how much materials they had ordered or used. Other sources of residential building loans include pension funds and insurance companies. Because construction costs can vary significantly over a two-month period, some builders planned to construct only the number of homes projected by their monthly research, then concentrated on selling the homes before beginning actual construction. Industry firms generally sell their homes through independent brokers or by employing salespeople retained on commission. These salespeople operated out of model homes and conducted tours, providing floor-plans and describing prices and design options. Available homes were advertised in newspapers, magazines, billboards, brochures, on radio, through out-of-state home shows, direct mail, video tapes, or special promotional events. Major sources of sales include referrals from customers or members of a region's home-building, real estate, architectural, or financial community, from traffic through model homes, and through bidding on planned residential development projects in competition with other builders. Operative building firms may also maintain customer service departments that conduct home orientation tours for buyers before the final sale as well as resolving problems occurring after the sale is final. In the early 2000s, the largest costs incurred by operative builders were construction on work subcontracted to other builders; materials, components, and supplies; and payroll. Industry firms took advantage of a number of strategies to control their costs including using subcontractors to perform home construction and site improvement on a fixed-price basis, obtaining volume discounts on construction materials and other special pricing arrangements from subcontractors, obtaining zoning entitlements before making land purchases, and minimizing their inventories of unsold homes by building a limited number of speculative homes in order to meet short-term demand. Some larger home-builders elected to lessen the financial risk inherent in residential construction by having a range of projects under development in several communities in each market at one time, thus minimizing their dependence on the success of any single project. Among the range of secondary activities engaged in by industry firms in the 1990s were the sale of improved lots, mortgage origination and title insurance services, cement aggregate and gypsum wallboard manufacture, and the purchasing and selling of undeveloped land. Other activities included the sale and asset management of commercial properties and sites, residential and commercial property rental, real estate investment trust (REIT) management, development and marketing of vacation ownership resort communities, savings and loan operation, and aluminum and wood building component manufacturing. The states with the largest number of operative builders (single-family construction) in the early 2000s were California and Florida, followed by New York, Pennsylvania, and Michigan. North Dakota, Alaska, South Dakota, Hawaii, and Wyoming have the lowest number of firms operating in this industry. Most operative building industry establishments specialize in detached single-family housing construction, while about 10 percent specialize in attached single-family housing construction, and a minimal number specialize in apartment building construction, office building construction, and other commercial building construction. Trends in the operative building industry in the 2000s included the continuing increase in the use of prefabricated and component parts, such as pre-finished walls, partitions, and stairs. Also, operative builders used a greater amount of non-wood construction materials in response to rising lumber costs and increased their reliance on computer-aided design and other software for home design and business tracking activities. Other characteristics of the industry in the early 2000s included a continuation of the trend toward larger homes (the average square footage of a new home in 2002 was 2,230, according to the National Association of Home Builders); improved construction tools and equipment; decreasing union representation among construction workers; a continuation of the rise in average home prices and land costs; an increase in the number of mergers and acquisitions among the largest national home-builders; increases in the amount of remodeling activities performed by industry firms; and gradual increases in the percentage of U.S. households owning homes, which totaled 68 percent in 2002. Despite recessionary economic conditions in the United States at the start of the twenty-first century, more people bought new homes, and the new homes they bought became increasingly lavish. This was due in large part to record low interest rates, which made housing more affordable, as well as to increases in the amount of financing available to individuals. According to the most recent statistics from the U.S. Bureau of Labor Statistics, the operative building industry (including single-family, multi-family, industrial, and office buildings) included 31,280 employees who earned an average of $40,950 per year. Roughly 36 percent of these employees worked in construction, while 21 percent worked in office and administrative support positions, 15 percent were in management, and 10 percent were in sales. Dallas-based Centex Corporation was the largest operative builder in 2003, with sales of $9.1 billion, reflecting 17.7 percent growth from the year prior, and 17,540 employees. Centex builds homes in 20 states and also in the United Kingdom. It also owns 80 percent of manufactured-housing producer Cavco Industries. Other companies with a strong presence include Pulte Corporation, based in Bloomfield Hills, Michigan. Pulte, which builds single-family homes across several price ranges, saw sales in 2003 grow 21.1 percent to $9.0 billion and employed 10,800 workers. The Ryland Group, based in Columbia, Maryland, focuses on the "typical" middle-class home; it had 2003 sales of $3.4 billion, reflecting 19.7 percent growth from 2002, and employed 2,558 people. Toll Brothers, which focuses on luxury housing, operates in 18 states. The Huntington Valley, Pennsylvania-based company had 2003 sales of $2.7 billion and 3,416 employees. The Rouse Company, based in Columbia, Maryland, is a real estate investment trust (REIT) that specializes in retail properties such as shopping centers; its 2003 sales were $1.2 billion and the company had 3,696 employees. Other companies include Engle Homes, Inc., based in Boca Raton, Florida (sales in 2003 were roughly $1 billion); Atlanta-based Beazer Homes ($3.1 billion in 2003 sales and 2,986 employees); and Hovanian Enterprises, Inc. of Red Bank, New Jersey (2003 sales of $3.2 billion; 3,249 employees). Bureau of Labor Statistics. 2000 National Industry-Specific Occupational Employment and Wage Estimates: SIC 153-Operative Builders. Washington, DC: 2000. Available from http://www.bls.gov/oes/2000/oesi3_153.htm . Hoover's Online. Austin, Texas: Hoover's Inc., 2004. Available from http://www.hoovers.com . National Association of Home Builders. 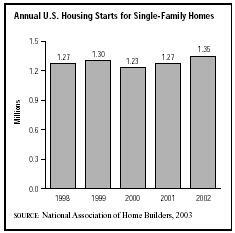 Housing: 2004 Fact, Figures, Trends, 2004. Available from http://www.nahb.org/ .